Well, the weather outside is definitely frightful, but the hot drinks at local bars are so, so delightful. Which is why anytime that wind whipping out of the north whips too much cold air my way, I duck into a favorite spot and warm myself with an adult drink like the below five. Just in case it’s so cold you can’t even stand to walk out that front door, I’ve also dropped in a recipe for a hot drink you can make at home, perfect for serving friends or family this season. A good toddy, with spirit, sweetener and citrus, is always nice – but this is extra nice, thanks to the inclusion of Woodinville Whiskey Co. bourbon, Italian liqueur Tuaca, lemon juice and a hint of cinnamon. While a wet cold day means you’ll probably (though some northwesterners I know wouldn’t let that keep them in) want to sip this cuddler inside, if it’s cold and dry try it around the Hollywood’s outdoor fire. Not only is it charming, but you can gaze upon the Woodinville Whiskey distillery as you sip their bourbon. 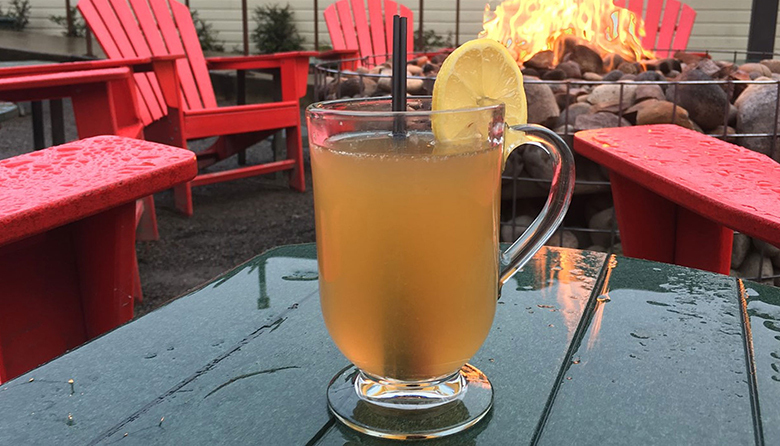 There should be more hot spiked cider options on winter menus, I believe – I mean, hot cider’s been consumed as a cold-chaser for hundreds of years. Luckily, Cap Hill’s Witness has this tempting variation on the theme. With George Dickle rye, Giffard’s Creme de Peche liqueur, lemon juice and cloves mixed with cider and served up warm, you can bet you’ll be shaking the chill off in no time. Living within one of the world’s most buzzing coffee centers here in the Puget Sound region, it’d be remiss to not consider a coffee drink when you need to warm up. At this Redmond spot, they take espresso and add another warming layer with dark rum, plus a little light brown turbinado sugar and cinnamon. They call it an “enticing breakfast treat,” and I certainly agree. This drink’s name almost looks algebraic or scientific in a way that might make the brain overwork – but have no fear, it only refers to Rhum Vieux Agricole VSOP and Bénédictine, the two ingredients served warm together at this Pioneer Square bar. If you don’t know, Rhum Agricole is like rum, but also not, made according to strict rules in the West Indies from local sugarcane pressed into juice. Mixed with legendary French herbal liqueur Bénédictine, you’ve got a magical warm combo. As mentioned above, coffee rules in our locale, so no surprise that we have two differing coffee drinks. In this one, they start with drip coffee, which is then adulted up with El Jimador Tequila and Kahlua, as well as a little Monin vanilla syrup and some half and half that’s been steamed and frothed to a latte-consistency. It’ll not only heat you up, but wake you up, and be an interesting accompaniment to one of the restaurant’s pizzas. 2. Warm a coffee mug or sturdy glass goblet by running it under hot water, and then dry it quickly.